You may start your tour at any of the 9 stops throughout the city. Please present a mobile or printed voucher to board the bus. 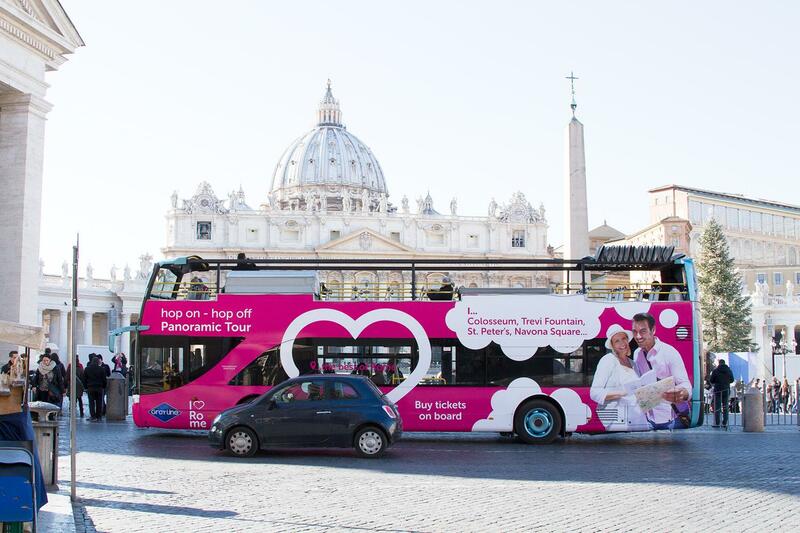 Organize your own tour of Rome by boarding one of our pink double-decker buses at any of the clearly marked stops throughout the city. With 9 central stops that cover all of the must-see attractions, you can visit the Vatican City, Spanish Steps, Roman Forum, and the Pantheon to learn about the history and culture of Rome with the provided audio commentary. Also known as The Eternal City, the incredible architecture, historical museums, lovely culture, and beautiful art of Rome will show you why it is one of the most visited cities in the world. Our buses are on the move all day long, so spend as much time as you want at any of the attractions or stops. Exploring Rome is sure to be an unforgettable experience, and we can't wait for you to experience it with Gray Line! The audio was informative but its did not work in a few seats we were at. there were only 9 stops and a large distance between some stops I think they could probably add in another stop or 2 .Otherwise it was a great experience. Excellent tour, with very useful dialog about the area we are seeing. Clear audio in our language is great. Narration over the headset was very helpful, route was great for the city of Rome. Would have given it a five star but the narration stopped halfway through the second day.